What 's the name of the imaginary creatures? The word mogwai is the transliteration of the Cantonese word ?? (mo1 gwai2) (Mandarin Chinese: ?? ; pinyin?mógu?) meaning "monster", "evil spirit", "devil" or "demon". 1. An imaginary gnome-like creature to whom mechanical problems, especially in aircraft, are attributed. 2. A maker of mischief. Word History: Elves, goblins, and trolls seem to be timeless creations of the distant past, but gremlins were born in the 20th century. In fact, gremlin is first recorded only in the 1920s, as a Royal Air Force term for a low-ranking officer or enlisted man saddled with oppressive assignments. Said to have been invented by members of the Royal Naval Air Service in World War I, gremlin is used in works written in the 1940s for "an imaginary gnomelike creature who causes difficulties in aircraft." The word seems likely to have been influenced by goblin, but accounts of its origin are various and none are certain. One source calls in Fremlin beer bottles to explain the word; another, the Irish Gaelic word gruaimín, "ill-humored little fellow." Whatever the word's origin, it is certain that gremlins have taken on a life of their own. They are called gremlins, gnomes, elves, goblins. In our film, there is an opposition between “mogwai”: the pure, intact and innocent creature before its “fall” and “ gizmo”, the nickname given to “mogwai” by Billy’s father, the inventor of the American family. Friends, let me introduce myself. That's me there on the corner. And I have a story to tell. Who hasn 't got a story? Well, nobody's got a story like this one. It all started here in Chinatown. The first scene takes place in the streets of Chinatown, New York City in the USA. No, they aren’t deserted. Quite the opposite! Are there many people in the streets? Yes, there are many people in the streets. It is dark and the scene takes place during the night. Joe Dante is the film-maker. He is very fond of horror and keen on suspense. He likes shooting films with a lot of actions and suspense. The beginning is mysterious, strange and scary because of the dark streets at night. It is also strange because of the full moon. - Other elements: the beginning of the film when the narrator says that his story is different from other stories and that it is the best! Honey, this is the gentleman who sold me the mogwai. "Sold. " An interesting choice of words. Conflicting eyewitness reports concerning "little green men".. There was, I believe, a box. With mogwai comes much responsibility.But you didn't listen. And you see what happens. You do with mogwai what your society...has done with all of nature's gifts. You understand what  he says when he speaks to you? To hear, one has only to listen. Perhaps someday you may be ready. Until then, mogwai...will be waiting. Before you go, I wanted to tell you...that I am truly sorry for what's happened. And if you would accept it, I'd like to...give you this small token. There's one other one. This is an invention of mine. Man at gas station tried to sell me. look under all the beds. Because you never can tell. There just might be  a gremlin in your house. « I have got sharp long ears and spiky teeth! For they are a little people, smaller than Dwarves[...]. Their height is variable, ranging between two and four feet of our measure. [...] All hobbits had originally lived in holes in the ground. Blanche-Neige et les Sept Nains (1937) : le dessin animé que regardent les Gremlins au cinéma. L'Invasion des profanateurs de sépultures (1956) : Billy et Gizmo regardent ce film dans la chambre pendant que les mauvais mogwaïs s'empiffrent. Gizmo semble être assez effrayé par le film ! La vie est belle (1946) : la mère de Billy regarde ce film à la télé tout en faisant la cuisine (elle affirme que ce dernier est triste), juste avant que le père ne revienne avec le Mogwai. Pour plaire à sa belle (1950) : Gizmo est très ému par ce film lorsqu'il le regarde à la télé dans la chambre de Billy. À la fin du film, il y repense lorsqu'il parcourt le magasin de jouets en voiture. L'Empire contre-attaque (1980) : lorsque Stripe qui envoie tout ce qui lui tombe sous la main sur Billy, référence à la scène entre Dark Vador et Luke à la fin de l'épisode V de Star Wars. Hurlements (1981) : lorsque Billy descend à la cuisine afin de chercher de la nourriture pour les Gremlins affamés, on aperçoit un "souriard" sur la porte du frigo. Celui-ci annonçait la venue du loup-garou dans Hurlements du même réalisateur. Plus tard, des photos du film sont affichées dans le cinéma où les Gremlins regardent « Blanche-Neige ». La Machine à explorer le temps (1960) : lorsque Rand appelle sa femme depuis le congrès des inventeurs, on aperçoit derrière lui la machine à explorer le temps en train de monter en puissance. Puis on voit les cocons, et lorsque la caméra revient au congrès, la machine a disparu, laissant des visiteurs perplexes. Flashdance (1983) Dans la scène du bar, on peut voir un Gremlins en tenue de danseuse imiter la chorégraphie de l'héroïne de Flashdance. Planète interdite (1956) : on aperçoit Robby le robot au congrès des inventeurs, notamment dans une conversation téléphonique où il parle avec un chapeau sur la tête. Ses paroles sont tirées de la fin de Planète interdite lorsqu'il discute de production d'alcool avec le cuistot du C57-D. Le Magicien d'Oz (1939) : le personnage de Mme Deagle est très proche d'Almira Gulch, la voisine acariâtre de Dorothy. Elle vient d'ailleurs à la banque pour chercher le chien de Billy qu'elle accuse d'avoir démoli son bonhomme de neige importé de Bavière. La mort du dernier gremlins est une référence à la mort de la vilaine sorcière de l'ouest ( la sorcière reçoit de l'eau sur elle et commence à fondre = le gremlin sort de l'eau et frappé par le soleil,fond). Les Aventuriers de l'arche perdue (1981) : le panneau publicitaire géant de la radio « Rockn' Ricky Rialto » est fortement inspiré de l'affiche des Aventuriers de l'Arche perdue, comme de celle de Indiana Jones et le temple maudit sorti en 1984, deux semaines avant Gremlins. James Bond : Chez Dorry, Gérald le vice-président commande une vodka martini au shaker et non à la cuillère, qui est la boisson préféré du célèbre agent secret. Poltergeist : Lorsque Steven Spielberg fait son apparition sur un chariot avec la jambe plâtrée, il visionne une scène de Poltergeist. E.T. l'extra-terrestre : Quand le gremlin débranche la ligne téléphonique, il dit "téléphone maison". On peut aussi distinguer une figurine de E.T. dans le magasin de jouet lorsque le gremlin est caché dans les rayons. Nine monks go about the simple rhythms of their life, in the certain knowledge that they face an imminent death. Hardly a movie pitch which would have predicted success but Xavier Beauvois’s Of Gods and Men was not only runner up at this year’s Cannes Film Festival; it ‘s now the French Oscar entry – as well as taking more than 8m euro at the French box office. Part of its shocking appeal is that it’s based on a real story. In 1996, seven French Cistercian monks were kidnapped and then killed at Tibhirine in Algeria, amidst rising religious and factional violence. Their murderers were never found. “When it happened, as a nation, France was shocked,” says the film’s producer Etienne Comar. In the movie version, the group of French Brothers live a simple life dispensing medicine and comfort to their poor Muslim neighbours. As the countryside is terrorised by armed Islamic fundamentalists, there is an order for all foreigners to leave the country. Do the monks leave, or do stay to protect their flock, knowing that they are an inevitable target? “It is a very current film,” comments Comar. “It’s interesting to look at this atrocity as it happened before 9/11 – all the signs of what was to come were there. 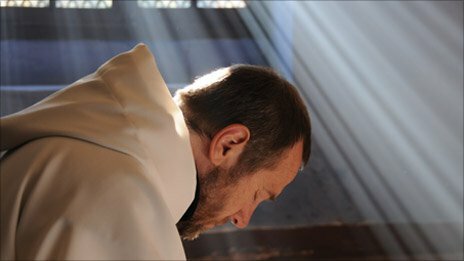 “When I re-read again the last testimony of the monks’ leader, Brother Christian, he was very aware of the co-habitation of Muslim and Christian neighbours. He seemed to have a sense that it was going to become a talking point. Ironically, the movie was filmed in Morocco, in a monastery south of Fez, which in the 1960s was used by a Benedictine order as a meeting point between Christians and Muslims. In the film, the monks and their neighbours co-exist in enviable friendship and harmony. Director Xavier Beauvois and his cast were sent to live in an actual monastery to prepare for the difference in the rhythm of monastic life. Viewers see the monks going about their daily business: praying, singing, healing the sick, cooking in the most unhurried, un-modern fashion. Yet hanging over them is a sense of sickening tension as events reach their conclusion. Some of the scenes – where the men share a supper as Tchaikovsky’s Swan Lake plays in the background, or as the community sing to drown out the threatening whir of military helicopters, are heartbreakingly beautiful. “I hope people will respond to it as a very universal film,” muses Comar. As well as the critics, Of Gods and Men has found praise with both the Bishops Conference of France and the French Council of Muslim Faith. But the most important critic for the film-makers must have been one of the survivors of the tragedy. “Two of the brothers escaped being kidnapped, and one of them, Brother Jean-Pierre, is still alive. “He is an old man of 87 now, and was unable to come to the cinema to see the film. But we sent him a DVD, and we recently received a letter from him. Of Gods and Men is released in the UK on 3 December. Comprehension about the Promises film project. While working on this film, you have contributed to the project: Congratulations! -one of the twins in the film says that when he was younger he used to pray for a stolen bike, to make a wish but mostly for…. E–religious practice: who does what? What is the Torah composed of? it is the seventh day in the Bible when God is supposed to have a rest after creating the earth, man and woman. G-Can you name a few details given by the litlle girl? the child in the film says she is not allowed to tear toilet paper. There is a lot of chance for peace without these meetings.